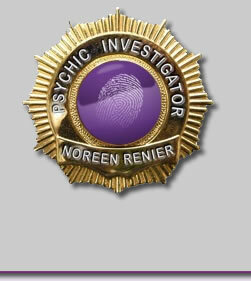 Noreen Renier is a Gainesville-based psychic investigator who was hired in the Laci Peterson case. Renier was able to use Laci's sweatshirt and shoe and an envelope to decipher clues. Scott Peterson, Laci's husband, eventually was charged with murder in the deaths of his wife and unborn son. A Gainesville woman has been making the rounds on national television lately, answering questions about her "psychic investigation" into the case of Laci Peterson, the pregnant California woman who was missing since Christmas Eve until her body was found April 14. 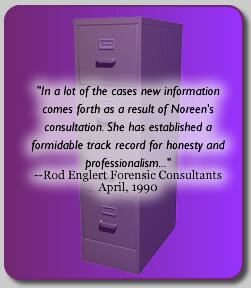 Noreen Renier, a "psychic investigator," recently appeared on "Good Morning America" and "On the Record" with Fox News' Greta Van Susteren, explaining that she was hired by the mother of Scott Peterson, the man arrested on April 18 on suspicion of killing his pregnant wife. The body of the woman and her unborn son were found a few days before his arrest along the rocky eastern shoreline of San Francisco Bay. Renier said she may have had a role in the Modesto, Calif., Police's focus on Scott Peterson as a suspect and given clues as to where to find the body, because they were e-mailed the transcripts of her three recorded sessions with Laci's possessions. Renier said that her technique is to touch the objects the victim wore or may have left behind, believing that objects emit a field of energy that can be "read" for information, images, visions, feelings, and so on. "The clues were all there, if the police followed up or not, I don't know," she said in an interview Wednesday. "Normally they do." The items Scott Peterson's family sent were a sweatshirt and a single shoe, but Renier said she picked up the strongest sense from the Priority Mail envelope that she said he had written on. "He wrote in his handwriting," she said. "It was like having him there at the sessions." The family of Scott Peterson, especially his mom, Jacqueline, repeatedly had said they believed Laci had been kidnapped, and Renier said that was the reason she was hired, to locate Laci. Renier said she dropped $200 off her normal $650 fee to Laci Peterson's mother-in-law because "I really wanted to work on the case." Renier's first session was March 2 and the last session was on March 27. But Renier said Scott Peterson's family may have been sorry they hired her because in the first session, it was apparent to her that Laci had been killed by a single male. She pointed out that soon after her first session, on March 5, Modesto Police reclassified the case as a homicide investigation. But Modesto Police would not comment on the case. In the other sessions, Renier said she saw clues to her whereabouts such as an inlet that would seep in from a larger body of water, a dock, cement used by the killer to sink Laci, a bridge and a campground or a park. Renier, an area resident for about five years, said she has been involved in more than 400 cases. Most of the time she is hired to help police in older cases where they are out of leads, she said. "I don't solve crimes, police do," she said, adding that it's up to police to make use of the assorted signs or clues she gives. Six years ago, Williston Police credited Renier with assisting them to end a two-year search for a 76-year-old man who had disappeared. But Renier acknowledges that she has her skeptics. Joe Nickell of the "Skeptical Inquirer" magazine devoted a chapter of a book he edited called "Psychic Sleuths" to Renier. "No psychic found Laci Peterson," he told The Sun, referring to how the bodies of the woman and her unborn son washed up on the rocky shoreline of San Francisco Bay. "I find it astonishing that (Renier's) getting this kind of press coverage, and no one is bringing up her failures," he said. With "psychic investigators," Nickell said, the trick is to throw out a lot of clues before the fact and once the case is solved match up vague statements with the facts. "They thrive on an uncritical media giving them attention," he said referring to the host of TV shows where Renier has appeared.